You say: Christmas, the French say: Noel. Paris is always a top holiday escape destination, but the City of Light is not the only place to have a 'Joyeux Noel'. In the wondrous South of France, Provence isn't just for summer tans. Winter in Provence is one of the most magical times to visit. There's still sun and fresh air and charming, uniquely Provencal seasonal traditions. There's the 'Big Supper' on Christmas Eve, culminating in a ritual of 'The Thirteen Desserts', said to represent Jesus and the 12 apostles. Local and family traditions vary, but the desserts often include almonds, figs, dates, and other local fruits and flavors. My favorite Provencal Christmas tradition is one that visitors can enjoy year round… and even take home as a souvenir or a gift. Santons are small, hand-painted clay figurines (the word is derived from Provencal dialect for 'little saint'). Santons make up table-top nativity scenes, but in a traditional Provencal nativity scene, it wasn't just the Holy Family, three wise men, angels, a shepherd and some farm animals. Traditionally, there were 55 figures that included characters from everyday Provencal life, like a fishwife and a vegetable seller. Santon-making is a family craft that is still passed down through generations today, and you can buy santons from workshops through the year. Marseille holds a December Santon fair, and there are also children's holiday santon painting workshops. Wherever the royal French motif, the fleur de lys, pops up around the world, it's a clue to that area's historic French ties. In New Orleans, the fleur de lys city symbol joins Creole and Cajun dialect, culinary and other traditions in an enduring, beloved, and unique culture. Two of its holiday traditions were originally observed only on Christmas Eve, but these days, visitors can celebrate the season with locals through the month of December. 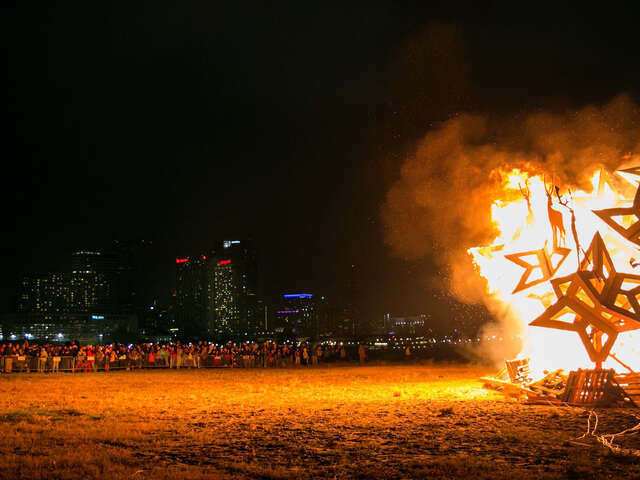 Bonfires on the Levee date back to the earliest Cajun settlers. They were set along the banks of the Mississippi originally to light people's way home for the holiday, or to Midnight Mass, or it's said most recently, to light the way for 'Papa Noel' – Cajun Santa Claus. They have become extravagant in size and design, some accompanied by fireworks and concerts, drawing crowds that feast on bowls of hot gumbo and community good cheer. A hundred or more may be lit every year in neighboring parishes, and visitors can take guided scenic tours of the experience. Reveillon Dinners were also once exclusively on Christmas Eve, following Midnight Mass. Now, instead of dinners starting at 2 am at home, Reveillon ('awakening') dinners are usually family and friends gathered at conventional dinner hours in a restaurant. Dozens of top city restaurants offer Reveillon menus through the month of December, not just on Christmas Eve, so it's easy for visitors to the city to participate in the tradition. James Beard Award-winning chef Frank Brigtsen of Brigsten's Restaurant is at the forefront of a new generation of New Orleans chefs who are revitalizing Creole/Acadian cooking, creating modern dishes that pay tribute to Louisiana's culinary traditions. He shared his Reveillon Dinner menu recipe for Oysters Bienville, named after Jean Baptiste le Moyne, the Sieur (Lord) de Bienville, the founder of New Orleans. 1. Melt 2 tablespoons of butter in a pot over high heat. Add the ham and cook for 3-4 minutes, stirring occasionally. 2. Add the onions, celery, and bay leaf. Cook over high heat, stirring occasionally, until the onions become soft and clear. 3. Reduce heat to low. Add the salt, white pepper, cayenne, thyme, oregano, and garlic. Cook, stirring occasionally, for 1 minute. 4. Add the sliced scallions (white part only). Cook, stirring occasionally, until the scallions become soft, 2-3 minutes. 5. Add the shrimp and cook, stirring occasionally, until the shrimp turn pink, 1-2 minutes. Add the brandy and cook for 1 minute. 6. Add the oyster liquor and cook for 3-4 minutes, stirring and scraping the bottom and sides of the pot. 7. Add the milk and cream and bring the mixture to a boil. Simmer for 3-4 minutes. Remove the bay leaf. Transfer the mixture to a tall container and purée until very smooth. Transfer the puréed sauce back into the pot. 8. Make a blond roux: Melt the butter in a skillet over medium-low heat. Gradually whisk in the flour and cook for 1 minute, whisking constantly. Bring the Bienville sauce to a boil and gradually add the roux, whisking constantly. Reduce heat to low and simmer for 1-2 minutes. Remove from heat. Refrigerate until fully chilled. 9. To serve, preheat oven to 500 degrees. Using a pastry bag, top each oyster on the half-shell with about 3 tablespoons of the Bienville Sauce. Bake at 500 degrees for 15 minutes. Serve immediately. It's a little piece of France in the Caribbean. Over the years, residents of the island of Martinique have combined the best of both worlds in their unique local Christmas traditions. One of the most charming must be the 'Fleurit Noel': the 'Christmas Flower'. 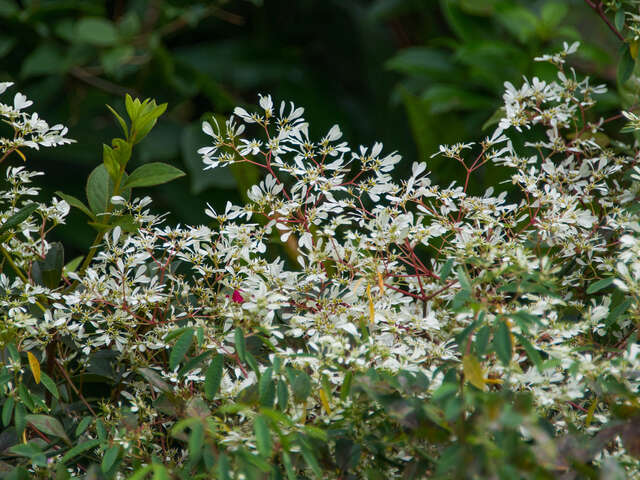 This delicate white flowering shrub made its way into local Christmas traditions due to a blooming season that runs December to March. It certainly makes me think of an angel's cloud! It's also thought to cure colds and flu. 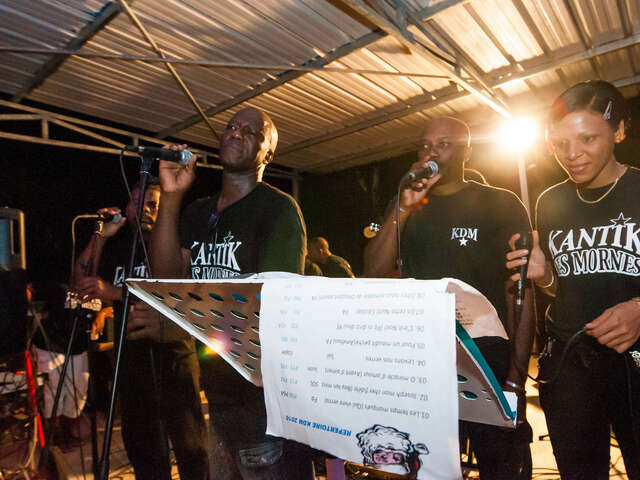 If you travel to Martinique during the holiday season, experience Christmas caroling like you've never experienced it anywhere else in the world. Chante Nwel are get togethers with traditional Martinican holiday cuisine - much of it pork based from a history of households keeping a pig in the backyard and making it the focal point of holiday meals - and singing accompanied by the goatskin tambour bele drum, and call-and-response. The carols are collected in a booklet of local versions in Antillean Creole, and you'll never forget the first time you sing - to the tune of 'Jingle Bells' - joyful song lyrics “Gut the Pig”, or other unique local twists on traditional carols. 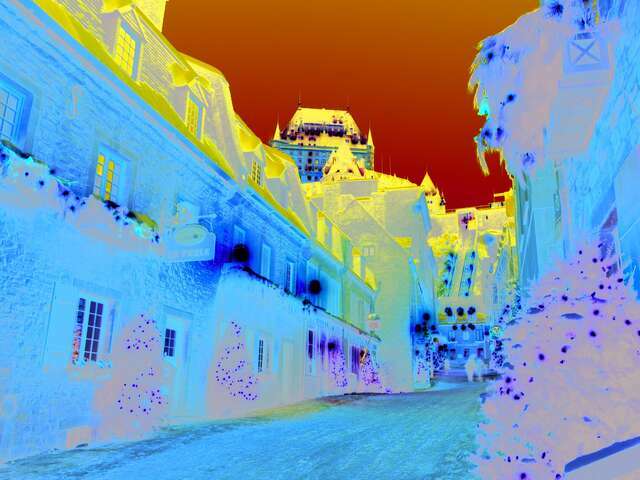 Quebec City, the cradle of French civilization in North America, is unforgettable. Built over 400 years ago, it is the only walled city north of Mexico, a UNESCO World Heritage site of stone buildings and steep rooftops true to the French architectural style of the day. Wandering the streets of historic Quebec City feels like a taste of Europe at any time of year, but during the snowy Christmas season it's truly magical – the city has been voted one of the top 10 places in the world to celebrate the holidays. 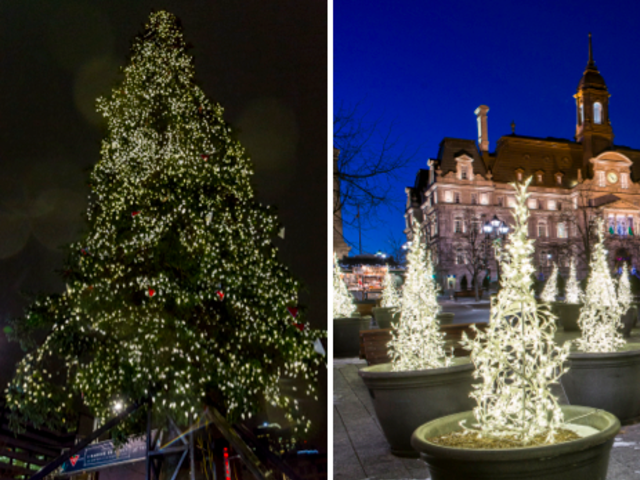 The province's biggest French city, Montreal, is Quebec City's slightly younger sibling, celebrating its 375th birthday this year with the tallest Christmas tree in Canada. Quebec is world famous for its music scene; make sure to attend caroling and concerts in both cities during the Christmas season, and do not miss the opportunity to go to Christmas Eve midnight Mass in one of the historic cathedrals. Photos: Tourisme Montréal. Giant Christmas Tree: Eva Blue. Place St. Jacques: Matthieu Dupuis. 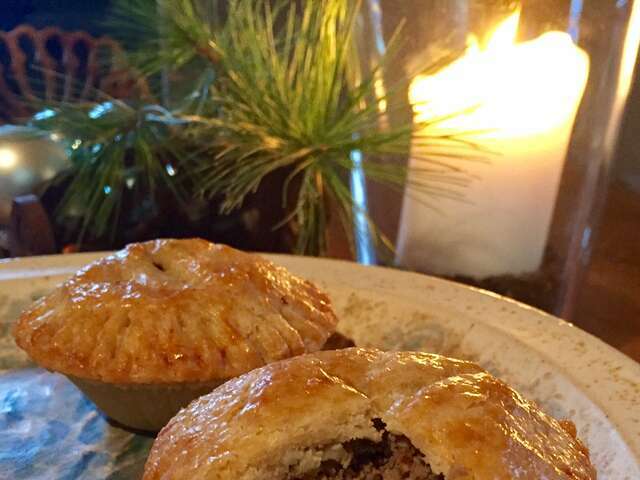 My mother's side of the family is French Canadian, and we follow the tradition of midnight Mass and a traditional 'Reveillon' meal, including tourtiere, Quebec's traditional meat pie, served with pea soup. Here's my family recipe for you to enjoy during the holidays or any time of the year. Mix thoroughly and cook 5 min. Let cool to room temperature. Wash tops with 1 egg beaten with 1 t water. Cook in pre-heated 410 degree oven til pastry deep golden. Serve hot. Bon appétit and Joyeux Noel! Here's 0 comments for "Celebrate the Holidays French Style Around the World"
add to mailing list and also will be a referral client $50 for any Hotel or AI over $1600 air excluded. Declined mailing list sent email and offered referral discount.